On Wednesday, Mr. Abdul Aziz Al-Shawash, Executive Director of the Public Authority for Investment Promotion and Privatization, met with Mr. Walid Shalloof, Director General of the National Center for Decision Support, in the presence of Dr. Abdul Ati Al-Tayef, Director of Promotion and Information Department of the National Centre and Mr. Osama Al-Jahani, Director of the Department of Cooperation and Foreign Relations. 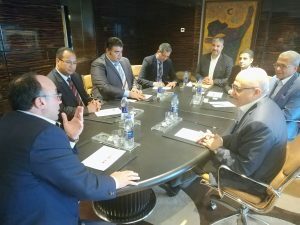 During the meeting, several topics were discussed concerning investment in Libya. 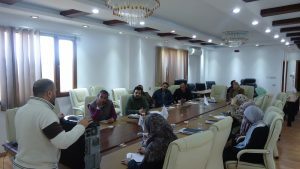 The two sides discussed how to arrange the mechanism of joint cooperation in the field of media training and benefit from the exchange of information and training experiences in some other fields. The meeting concluded with a joint memorandum of cooperation between the Public Authority for Investment Promotion and Privatization and the Decision Support Centre in the media field. 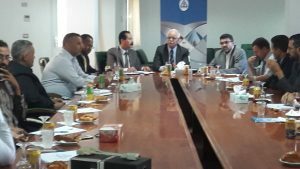 At the end of the meeting, the Director General of the National Center for Decision Support expressed his full readiness to build a good relationship with the Authority. The Minister of Economy and the Executive Director of the Authority met with representatives of Al Amma Company for Importing Cars and Hyundai for Car Manufacturing. 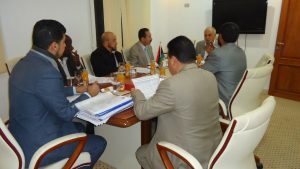 The meeting was preceded by a detailed presentation of a partnership project between the two parties on setting up a factory for assembling trucks in Libya. 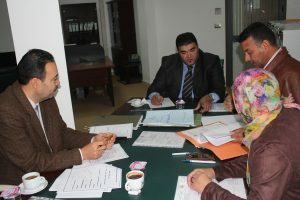 A number of Points and the stages of the project were also discussed. 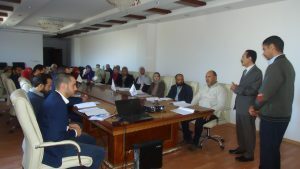 The Western Region Branch of the Authority held a number of internal training courses during the last period in the branch hall, which consisted of a training course in [customer service] and another training course in [administrative communication skills]. 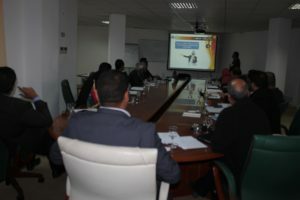 These courses included a large number of the branch’s personnel in order to increase the efficiency of personnel in a number of areas, such as preparing and writing reports, correspondence and meeting minutes, as well as developing the participants’ abilities in the importance of customer service and developing their skills in effective communication, which will contribute to improving the level of services offered to customers. 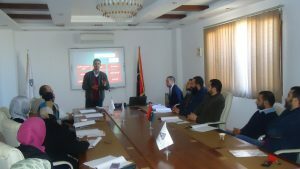 At the conclusion of the training courses, the trainees praised the level of the scientific material presented to them and their suitability with their job needs. 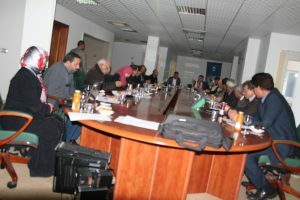 A preliminary meeting was held under the chairmanship of the Minister of Economy, which included the Executive Director of the Authority, the Director of the Investment Department of the Authority, and the Chairman of the Board of Directors of the International Beverage Company, in order to ascertain the company’s situations and resulted from this an elaborate meeting between the Authority and the Company draw up and discuss all the detailed points to settle the situations of the International Beverage Company and support it in order to restore the company’s full capacity. A special meeting of the Economic Team was held on Tuesday morning, 13 February 2018, which was attended by the members of this group, composed of the branches managers . 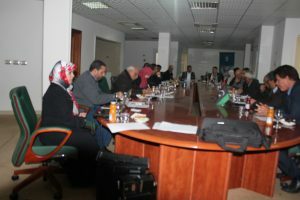 The meeting dealt with the discussion and study of a number of points and problems facing the investment projects. The overall points discussed – The study of investment requests from the technical and economic aspects. – Studying of applications for extension of exemption for investment projects. – Studying and finding out ways to make changes and amendments to investment projects. – The team will prepare a proposal to identify the development areas ,privileges and exemptions by coordinating with the concerned authorities and including them in the electronic container system. 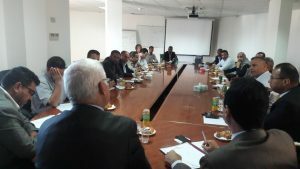 It is worth mentioning that this meeting is considered as a gesture to activate the Authority and the branches activity in the points of the. 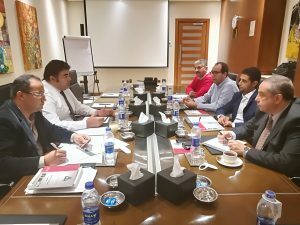 The Deputy Minister of Economy and Industry, Mr. Taher Sarkzak, and the Director of the Department of Studies and Planning, met with Mr. Mohamed Noha the Director in charge of the Authority and the directors of departments and offices in the Authority on Wednesday, 17/10/2017 at the General Authority for Investment Promotion and Privatization meeting hall, in order to identify some of the obstacles and difficulties faced by the Commission in performing its functions, and how overcome them and find solutions to them. 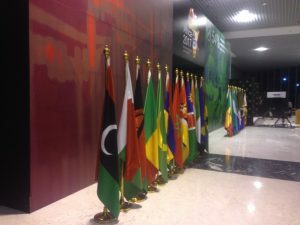 The “Africa 2017” Conference, organized by the Egyptian Ministry of Investment and International Cooperation in cooperation with the COMESA Regional Investment Agency, was launched on Thursday, 7 December 2017 in the Arab Republic of Egypt in Sharm El Sheikh. The conference was held under the slogan “Trade and Investment for Africa, Egypt and the World.” The General Authority for Investment Promotion and Privatization participated in the conference, represented by the Director General of the Authority, Mr. Abdel Aziz Chaouch, and the Director of the International Cooperation Bureau.